LGBT-friendly Subaru continues to reach new heights, primarily boosted by loyalty to popular crossovers like the sporty Crosstrek, compact Forester, and iconic Outback. But, the brand was left at the ropes of the large three-row crossover segment when the failed Tribeca bowed out. So, in developing the first-ever Ascent, Subaru stayed close to the stage with a vehicle that will give loyal owners a larger option in which to take pride. But it is also clearly a member of the extended Subaru family. The large grille and swiveling LED headlamps are replicas of those on the Outback. Bodysides are more massive, but echo the Forester’s proportions. Large 20” wheels fit the fenders. Around back, LED taillamps distinguish its visage. Our Touring edition ladled on chrome for the doorhandles, liftgate, and body. It would not look out of place on an Acura lot. To test the aft row, I slipped between the twin rear captain’s chairs and tried to get into the back. There was no legroom, so I started kvetching about how Subaru should have learned from the Tribeca before realizing middle row seats slide and fold forward –to ease entry into the rear and better balance legroom for the two rear rows when six people are aboard. Clever grab handles on the center seats – taken from Japan’s famous Bullet Trains – are much appreciated. On-road, the four-wheel-independent suspension does a good job of soaking up rough pavement. 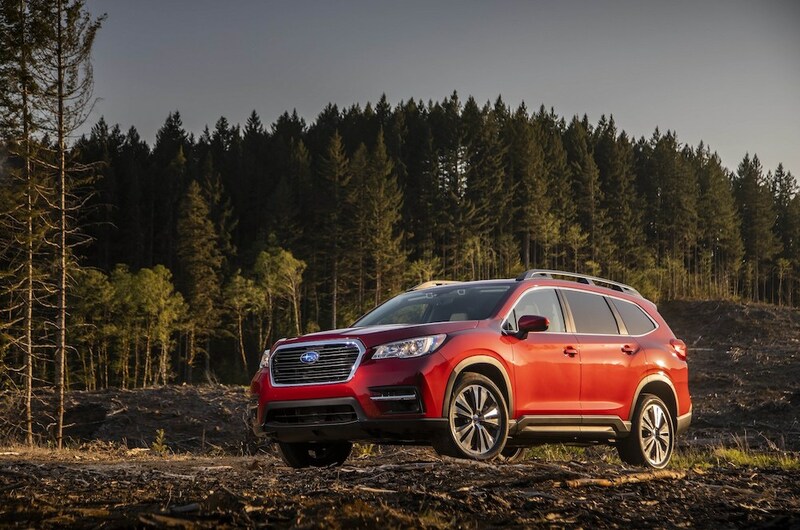 Since Subaru owners are apt to take their vehicles off-road, the Ascent comes with a high 8.7” of ground clearance and X-Mode with hill descent control to handle more serious trails. I liked the Tribeca. It was a little small and underpowered, but looked and drove nice (especially after the facelift). It just wasn’t the right three-row crossover for Subaru. With its peppy turbocharged powertrain, roomy interior, and conservative styling, Subaru fans can take pride in all it offers. A base price of $31,995, or $45,670 fully loaded, seems a good value against competitors like the Chevy Traverse, Honda Pilot, Toyota Highlander, and Nissan Pathfinder.